For all the shows and cons I’ve been to, I’ve only been on an official business trip once. I went to a FOCUS conference way back in 1999 down at Disney World; I remember the date clearly, because it was my first birthday after our wedding, and I was in Florida while my wife was stuck back in North Carolina. I tagged along with my wife when she went to a conference last year (again in the Orlando area, and while she was four months pregnant), but I don’t count that since I spent most of my time there stuck in the hotel room working remotely over VPN (or at least trying to since the hotel’s Internet access was lousy). When I went to WDW for the FOCUS event, I actually announced it in the GPF News on the off chance some reader might have been going as well. Of course, back in ’99, GPF’s readership was much, much lower than it is today, so the odds that some Faultie was also a FOCUS developer who just happened to be going to the same conference were pretty low. Needless to say, I didn’t run into any adoring fans (or even abhorring ones), and being the social wallflower I tend to be, I spent a lot of my downtime in my hotel room or at one of the Disney parks. Well, it’s eight years later, and I’m finally going on another business trip. I’ll be going to Brigham Young University on April 5-6 to attend the ID+SCORM conference being held at their conference center. It’s still not 100% official, but my manager told me today that he specifically wants me to go. Of course, considering the highly specialized nature of SCORM and ADL, the likelihood that any of you out there are also in that field is still pretty slim, but I thought I’d mention it anyway. I haven’t decided if I’ll mention it on the News or not; it’s not exactly GPF-related, but those of you who read this blog regularly are a tiny fraction of those who read the comic. Then again, I’ll be in Howard Tayler’s backyard, so maybe I should look him up…. I know I’ve been silent for a bit, but as usual that means I’ve been rather busy. However, I thought I’d pop a quick post up to keep you appraised of a few things worth updating you on. First, I’ve noticed several of you have tried to register for commenting, which means the mailer script previous mentioned seems to be working. I know this because I’ve been getting messages each time someone signs up. Unfortunately, I’ve received reports that when you try to log in to comment that you keep getting redirected to the login page (or just getting a blank page). Looks like we’ve still got some bugs to work out. The good news, however, is that I’m in the process of trying to move the blog to more reliable hosting. It’s probably going to end up “hidden” somewhere on Keenspot; it will be on their servers, but it won’t be accessible from the Keenspot header drop-down or main page. That means there will probably be ads to offset Keen’s hosting costs, but that also means I’ll get a little extra ad revenue (or PREMIUM subscriptions) for each visit you make to the blog. This is something I don’t get at the moment, and it sure beats spending money on hosting elsewhere. If for some reason Keen elects not to host the blog (which is within in their rights as a host), then I’ll probably be moving to some other host where I will be paying, and they’ll probably be ads anyway to offset the cost. Now for GPF. I haven’t fully decided on this yet, but I’m seriously considering adding a few extra updates starting in March. Now before you get all excited, these additional updates will probably not be comic updates. I’m still not comfortable with my comic generating output to increase the update frequency. However, I am considering some optional extras to be updated during the week to keep you guys coming to the site (and, to be completely honest, to keep my page views and thus my ad revenue up). Most likely, the main comic will update on Mondays and will remain weekly for the time being. Then there will be additional updates on Wednesdays and Fridays with extra content for those who are interested. The primary candidate for the Wednesday update is reruns of Jeff’s Sketchbook, our PREMIUM-exclusive weekly extra content. Now, for your PREMIES out there, this won’t be a permanent thing; this is only filler until the main comic is producing at a frequency that I can do M-W-F updates again. In addition, I’d start running the Sketchbook from the beginning, so sketches that run on the main page will be around five years old. The freshest sketches will continue to be on the Sketchbook site. Another bonus for PREMIES is that these Wednesday reruns will not go into the main GPF archive; they will run on the main page from Wednesday to Thursday of a given week, and then will only be available again from the Sketchbook archive, which requires a PREMIUM subscription. Thus, non-subscribers will get a weekly two-day peek at five-year-old Sketchbook content, which will then go back into the vault where only subscribers can see it. I like to think of it as an incentive for non-subscribers to sign up, and as a trip down memory lane for loyal Faulties who already have a subscription. The Friday update is, unfortunately, the big question mark, and why this entire plan may fall apart. I currently don’t have a long-term content stream to populate the weekend. Like the main page Sketchbook update, Friday updates would not go into the main GPF archive. However, depending on what gets run, it might go into its own archive elsewhere on the GPF site. Prime candidates are some of my old junior high, high school, and college comics (if I can find any that aren’t blatant copyright and trademark infringements), some sketches and concept art not currently in the Sketchbook, or other similar non-GPF content. I’ve also seriously considered abandoning my plan to make Surreptitious Machinations II a PREMIUM-exclusive and running it as a weekly main page feature. The updates would then go into their own archive, which will remain open and not behind PREMIUM. The problem with this last one is that SM2 is only about one-fifth of the way finished, and I would either need to spend extra time finishing its pages (thus taking time away from the main strip) or running rough scripts (which are complete but very sketchy and sometimes difficult to follow) and then replacing the sketches with finished comics later. Of course, I’m always interested in what you guys have to think about these ideas. Unfortunately, since commenting doesn’t seem to work at the moment, I invite you to visit the GPF forum and discuss it there. In fact… there, I’ve created a thread especially for it. Please give me your thoughts. I’m really beginning to miss those mild North Carolina winters. I’ve been told that we’re supposed to have a mild winter here, but so far I’ve seen more snow in the past few months I’ve been back in West Virginia than I saw in all nine years I was in NC. It’s been cold, the wind chill has been even colder, and the morning commute from Beckley to Hinton (about 37 miles (~60 km) or 45 minutes) has been treacherous, especially this morning. We had about five inches (12.7 cm) of snow last night and the roads were terrible. If it weren’t for the fact that I need to give a demo today, I would have requested to work from home. I took this picture last night on our back porch. 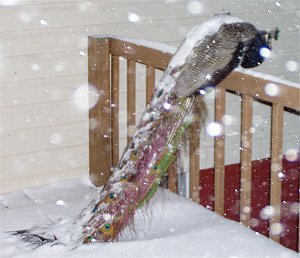 This guy is the neighborhood peacock, taking some shelter from the wind and snow. I think he likes that particular banister because it’s right over the drier vent, so hot air is almost constantly blowing up from there. Um, yeah, you heard me. It’s really an odd story. Nobody really owns him that I know of. He simply roams around, going wherever he wants, strutting his stuff around our little housing development. And in case you think it might be odd that a “wild” peacock is wandering around in suburban WV, then you’d be quite right. I’m not sure if there’s an official story, but the one I’ve heard through the grapevine is that there’s a peacock farm somewhere in our vicinity, and this guy’s an escapee. The farmer tracked him down and brought him back several times, but he’s pulled a Houdini each time. Eventually, the farmer gave up and the peacock took up permanent residence somewhere nearby. He undoubtedly considers our neighborhood part of his territory and patrols it regularly. None of the local dogs or other potential predators seem to bother him, perhaps because of his size (or maybe his disposition). I haven’t had much interaction with said peacock since we moved in. It seems that each time he’s been spotted, I’ve been somewhere where I couldn’t see him (like at work) or he’s been far enough away that all I’ve caught is a quick glimpse at a distance. Then during the last snow storm, I saw some interesting animal tracks that I couldn’t recognize along our back porch. I followed them, thinking they were going the opposite direction that I was, only to find him perched on the banister as you see him here. He sat there rather calmly, obviously not considering me a threat. When I took out the garbage last night, he was there again, so I took the opportunity to snap his picture. Not a good blog weekend. But now the weekend is over, and everything looks to be back in working order. For the moment. I hope. Comments should now work, I believe. Tim from Germany came to our rescue again and pointed me toward a WordPress plugin called wpPHPMailer. This wraps the more generic PHPMailer script into a WP plugin and allows WP to send mail via a third-party SMTP server instead of through PHP’s mail() function, which uses the server’s built-in mailer (like sendmail). Thus, I can get around the problem of WP sending out password confirmation e-mails and commenters should be able to register. You’ll find the registration link in the Meta part of the side bar (right above the “brain dump truck” image). As for why the blog was down all weekend… blame my ISP. Sometime Saturday, our power flickered. The computers were fine, as the laptops went on battery power and the desktops flipped to the UPS. However, something must have happened between the ISP’s router and our cable modem to cause them to “lose” our cable modem’s MAC address. Yeah, I don’t understand that one either. The ISP and the cable modem wouldn’t talk to each other, so we couldn’t get an IP and thus couldn’t get online. My wife (who works from home and thus needs VPN access) called the ISP and got things settled sometime yesterday morning. Now hopefully I can post about something other than what’s wrong with this blasted site.